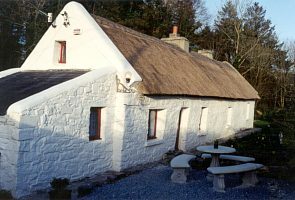 Mary Rose Cottage is located in beautiful County Kerry, Ireland, and is only a short 90-minute drive from Shannon International Airport. It is an 18th century thatched stone cottage, which has been lovingly restored to its original beauty and is furnished with simple, yet rustic antiques and accessories. 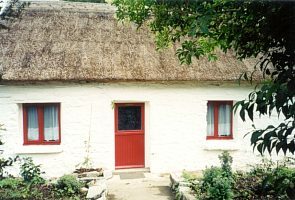 And with all of the modern conveniences, it is the perfect place to call home while exploring the southwest part of Ireland. This region is well known for it's beautiful views of dramatic mountains, green valleys, rugged coastlines, megalithic sites and rural charm. The popular nearby towns of Killarney and Tralee are filled with festive stores for shopping, pubs and restaurants for dining or snacking. One of the most dramatic and scenic drives in all of Ireland, called the "Ring of Kerry", can be found starting twelve miles away. The mountains that make up the ring and others can be viewed from the property, as it is nestled in a countryside valley. This area is superb for walking and taking in fresh air, views of local people and places, as well as interesting ruins, stone walls, flora and fauna of all kinds. The small but bustling town of Castleisland is five minutes away and has grocery stores, souvenir shops, pharmacies, and a large general store. The local attraction and Castleisland's claim to fame is the Crag Cave, which was discovered in 1984. It is a phenomenal place to explore the wonders that lie beneath Ireland's green surface. After a tour through the cave, one can relax with a warm bowl of soup or sandwich in the restaurant, or explore the souvenir/gift shop, which is filled with locally made products and mementos. As you enter through the traditional double door you are greeted by a beautiful rustic stone fireplace and soaring ceilings. All floors are gleaming pine. The hearth room is probably the most typical with it's cozy hearth side bench. The adjoining sitting room is a great place to curl up on the sofa and read while also enjoying the fireplace and views of the emerald green hills. This sofa also folds out to accommodate two guests. Enjoy the TV and VCR from here as well. There is a bedroom off this room with a double bed and Gothic coat press (armoire), a perfect place for clothing storage. Above the sitting room is a loft bedroom that overlooks the fireplace and has a single bed. 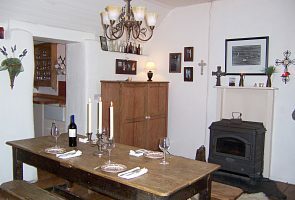 At the other end of the cottage is a huge dining room with a large farm table that can seat up to eight. The oil burning stove adds to the great feeling this room has. The main bedroom is off the dining room and has a double bed, dressing table and large pine linen press with shelves for your clothing. It's views are of the ravine and front garden. The bathroom has a claw foot tub with a shower attachment. The kitchen is fitted with stove and hob, fridge/freezer and washer/dryer combo. A full window overlooks the garden. There is a door that leads out to the patio where you can sit and listen to the rushing stream below. The cottage gardens are surrounded by original stone fencing and fuchsia hedges. 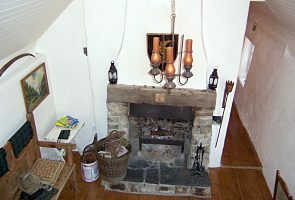 Other facilities of the cottage include full central heating, telephone, parking and an open fire. All linen is provided.